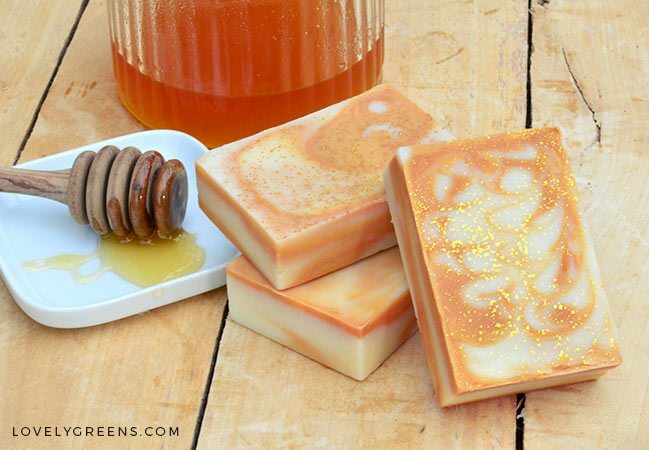 This natural honey soap recipe creates bars that look like fudge but have none of the calories. It’s made with simple layers of creamy and mica tinted soap batter and subtly scented with raw golden honey. Dressed up in festive bakers twine and sprinkles of gold mica, it makes a lovely and guilt-free gift. This one pound (454g) recipe will create 5-6 standard sized bars. If you’re interested in getting the same soap mould, there’s a link below. If you’ve never made soap before, I highly recommend that you look through my free natural soap making for beginners series. Beginning with Ingredients, the series will walk you through the materials and equipment you’ll need and an introduction to the soap making process. In a small container, mix the powdered gold mica powder into about a Tablespoon of the olive oil. It will look like liquid gold! A small fork, mini wisk, or milk frother will help to blend it. Make sure your goggles, gloves, and apron is on before you make your lye solution. Move away from the lye and begin melting the solid oils together on the lowest heat possible on your hob. When there are just a few pieces of solid oil floating in the pan, turn off the heat and move the pan to a pot holder. Stir with your spatula until all of the oils are melted. When the solid oils are melted, pour the liquid oils into the pan. Use the spatula to get as much of it in as possible (castor oil has a real tendency to stick). Now measure the temperature of your oils with your digital thermometer. You’re aiming to get it down to about 110°F / 43°C or slightly higher. Once you have a read on your oil temperature, head back over to the lye solution and take its temperature too. It’s fine to go back and forth with the digital thermometer for both. 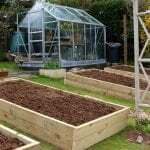 The lye solution should be within ten degrees of the oils and can be either warmer or cooler. When the temperatures are right, it’s time to mix the lye-solution with the oils. Pour the lye-solution through the mini strainer (to catch any pieces that might not have dissolved) and into the pan of warm oils. Continue pulsing and stirring your soap batter until it hits a light ‘Trace’. This means that the batter thickens and if some of it dribbles down from the stick blender, it will leave a mark on the surface of your soap-batter before melting back in. It’s important for this recipe that the trace is not too thick, otherwise it will be difficult to create the effect. When your soap batter has thickened to a ‘light trace’ it’s time to stir in the honey and the Grapefruit Seed Extract. Grapefruit Seed Extract is an antioxidant and will help keep the oils in your soap from going rancid. Pour each of them into the soap and gently stir until they are all dispersed. Give it a good 20-30 seconds of stirring. Pour about a third of the soap batter into a separate container and then pour add the gold oil to it. Stir well. Now the fun part! To get the same effect you’ll need the same 6 Cavity silicone soap mould that I’m using. You can adapt the technique for a larger loaf mould but it will turn out looking a bit different. 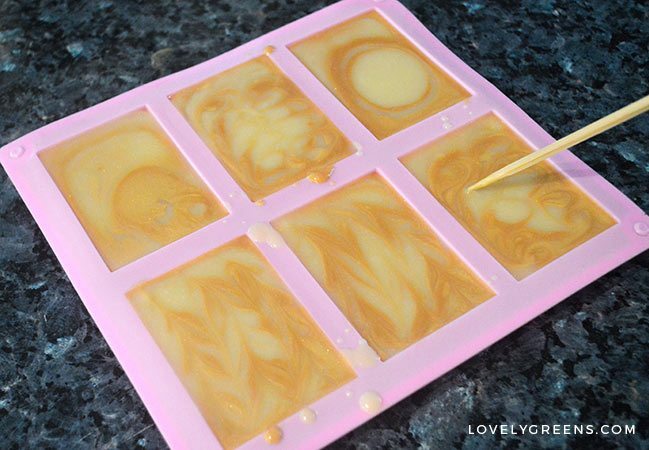 You are going to alternate pouring a Tablespoon of the uncoloured soap batter into one corner of each cavity, with pouring a teaspoon of the gold directly on top. A Tablespoon of the white batter, a teaspoon of the gold in the same exact spot until the cavity is filled. I actually filled all six cavities at the same time instead of focusing on just one. It might speed up the process. 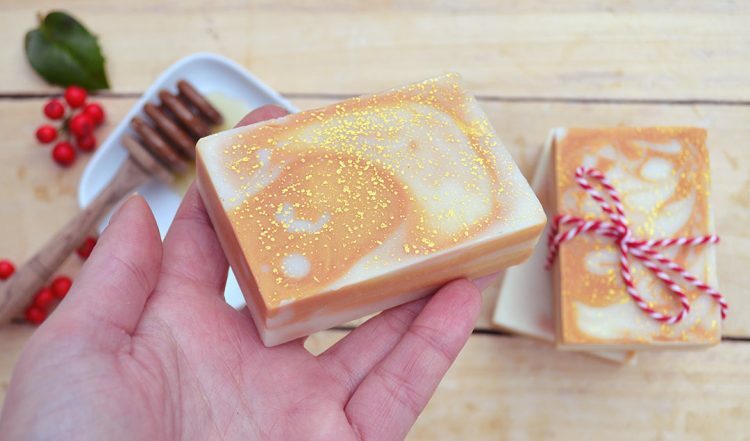 To finish the soap, I used a chopstick to lightly swirl the tops of the bars and then dusted them with gold mica. Use a fine sieve to dust the soap just as you’d dust a dessert with icing sugar. After 24 hours you can pop your soaps out of the mould. It’s relatively soft to begin with but as it cures, it will harden. After the time is up, your soap is ready to be used. For the holidays, wrap the soaps in festive paper and string to give away as gifts. Hi Ada. Nope, all you do is leave them sitting on the counter at room temperature. No need to insulate. 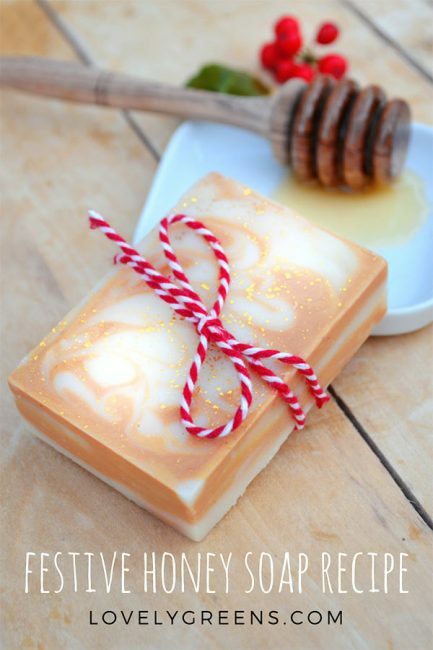 Thank you for sharing this wonderful soap recipe! I’ve made it twice now, the first time I mixed it too long and it was too thick to make nice looking swirls of any kind! But I tried again and made sure I was at a much thinner trace and they came out great, I did do an in the pot swirl instead of pouring separately but they look great! Thank you so much! I love making my own soap! 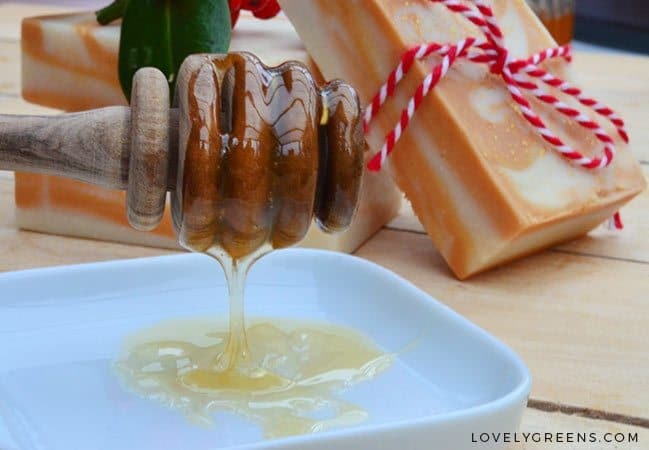 Im obsessed with the Honey I Washed the Kids from Lush, can you tell me if this is similar? Also is there a link somewhere to subscribe to your page? Im not seeing it if there is…. Hi Amanda! I’ve not used Honey I washed the Kids but think I’ve smelled it before in a shop. It has sweet orange and bergamot essential oils as well as honey. The scent won’t be the same as my recipe but you could always use your own choice of essential oils when making the batch. I just discovered all of your newsletters in my junk folder, because they begin with “Tanya at lovely” . I’m certain this is happening to other people also. 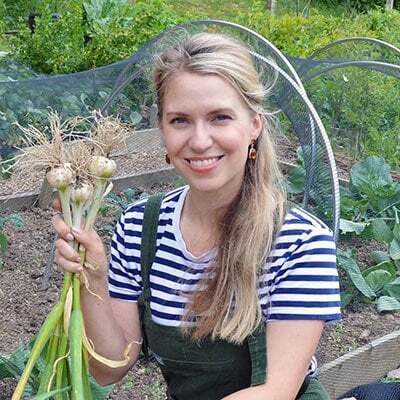 “Garden Living with Tanya” maybe? isn’t this temp a bit cool for the beeswax? I thought you were supposed to soap over 160 degrees if using beeswax. Though the melting point of beeswax is 144-147 F (62-64 C), it will stay in a melted state with other oils down to much cooler temps. This means that you can soap at normal soaping temperatures. 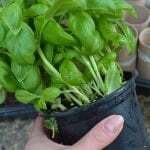 Can i substitute olive oil for the olive pumice oil? Can I purchase already made soaps from you? Beautiful! I love the smell of honey too.